Andrew is kind enough to provide explanations and benchmark results though this is far from the first notion of this problem I hear about. Many other companies looking to optimize MySQL problem, especially in analytics space when expressions should be computed over hundreds of millions of rows have expressed their concerns with this part of MySQL execution. I’m wondering if we’re going to see any improvements in this space by Oracle, MariaDB or Drizzle. I think Drizzle is in advantage here – with simplifying MySQL functionality a lot they probably can also simplify expression handling to be faster. In XtraDB we have the table INNODB_BUFFER_POOL_PAGES_INDEX which shows which pages belong to which indexes in which tables. Using thing information and standard TABLES table we can see how well different tables fit in buffer pool. You can also see in one of the cases the value shown is a bit over 100% – I am not sure where it comes from but more pages reported to belong to the table in buffer pool than on disk. Though it seems to work well enough for estimation purposes. Along with maximal possible fsync/sec it is interesting how different software RAID modes affects throughput on FusionIO cards. In short conclusion, RAID10 modes really disappoint me, the detailed numbers to follow. To get numbers I run sysbench fileio test with 16KB page size, random read and writes, 1 and 16 threads, O_DIRECT mode. FusionIO cards are the same as in the previous experiment, as I am running XFS with nobarrier mount options. OS is CentOS 5.3 with 2.6.18-128.1.10.el5 kernel. In this case for all modes use 64KB chunk size ( different chunk sizes also interesting question). There is graph for 16 threads runs, and raw results are below. but RAID10 modes over 4 disks surprises me, showing almost 2x drops. 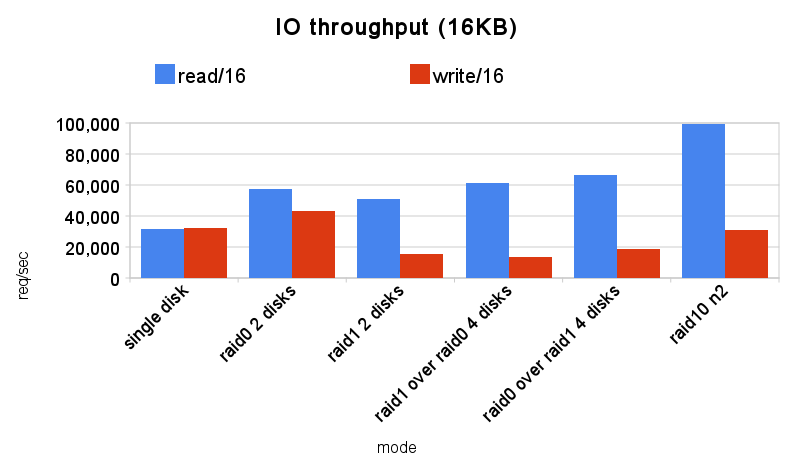 Only in RAID10n2 random reads skyrocket, while writes are equal to single disk. on regular hard drives or SSD disks. The performance drop in RAID settings is unexpected. I am working with Fusion-io engineers to figure out the issue. The next experiment I am going to look into is different page sizes. It is time to announce the next version of backup software from Percona – XtraBackup 1.1. The binary packages for RHEL4,5, Debian, FreeBSD, Windows, Mac OS as well as source code of the XtraBackup is available on http://www.percona.com/percona-builds/XtraBackup/XtraBackup-1.1/. Debian and RPM are available in Percona repository. As soon as we get couple FusionIO cards, there is question how to join them in single space for database. FusionIO does not provide any mirroring/stripping solutions and totally relies on OS tools there. How many fsync / sec FusionIO can handle, and check what overhead we can expect using additional layers over FusionIO card. The card I used is Fusion-io ioDrive Duo 320GB, physically it is two cards on single board, and visible as two cards to OS. By some reason I was not able to setup LVM on cards, so I’ve finished tests only for software RAID0 and RAID1. Duo card has better characteristics. RAID0 shows some overhead 8%, but it is acceptable. And something is terrible wrong with RAID1, I am getting 40x drops in amount of fsyncs. So it seems we can’t use innodb transactional log files with innodb_flush_log_at_trx_commit=1 on software RAID1 over FusionIO. And next steps is to check how RAID setup affects IO throughput. Too many connections? No problem! Did that ever happen to you in production? Just happened to one of our customers. Want to know what we did? Type ‘help;’ or ‘\h‘ for help. Type ‘\c‘ to clear the current input statement. Credit for the gdb magic goes to Domas. You would usually have one connection reserved for SUPER user, but that does not help if your application is connecting as a SUPER user (which is a bad idea anyway). This worked for me on 5.0.87-percona-highperf, but use it at your own risk and better test it before you actually have to do it in production. These table show statistics about InnoDB tables ( taken from InnoDB data dictionary). Is your MySQL Server Loaded ? This corresponds to what is expected to be stress load but we can see MySQL is getting only spikes of concurrent query executions and most commonly there are no queries executing. Value 1 for Threads_running corresponds to the connection which runs “SHOW STATUS” so you need to subscribe 1 from the reported amount to see the true number. No wonder in the case above there were a lot of free CPU and IO capacity. In this case the load is higher and a lot more uniform – there are cases when actually 32 queries are active (this is test with 32 connections) – but you can see most of the time it is less than that. Looking at Threads_running is a very simple and powerful tool to see whenever you’re really putting sustained load on the database you may be expecting. It may be worth to explain what value of Threads_running represents. This is amount of queries which are being currently processing – the ball is on Server side. The server has gotten the query but has not completed sending response back yet. This is a very broad measure of activity – if query is waiting on IO, blocked on Mutex, table lock, row level lock, waiting on innodb_thread_concurrency it will be still considered running. This will be even the case when result of large query is being sent back and send operation is blocked because of slow network or the client. Because the measure is so broad it is very helpful to see if client is loading the server well – if it does the number of threads_running will be appropriately high. A few weeks ago, we had a query optimization request from one of our customer. The table have 549252 rows and of course, there is an index on the col1. MySQL estimated the cardinality of that index as 87, though what was of course misleading as index cardinality in this case can’t be over 9, as there is only 8(+ NULL) different possible values for this column. When you want to run this query mysql first will try to find each row where col1 is A or B using index. Then its going to order by the ID using file sort and then send first 20 rows ignoring the rest. In this case MySQL has 2 indexes where one is usable to find rows, while other is usable to return them in the right order. MySQL can chose only one of them to execute the query – use index to find rows. This is sensible strategy if there is no LIMIT, however it is poor chose if there is one – it is often a lot faster to retrieve rows in order checking WHERE clause for them until required number of rows were returned. Especially in the cases when WHERE clause is not very selective. In this case we forcing MySQL to do retrieve rows in sorted order and checking if it matches our original WHERE clause with subselects. It looks scary if we look at EXPLAIN but in reality the dependent subquery is only executed enough times to produce 20 rows in result set. not always slowing things down. wrote. about couple of years ago. Recently Alexandr announced new Percona-XtraDB-9.1 release, and now it is good time to summarize features we have and what is expected soon. was it disk table or in-memory, and how big was temporary table. guess what took so long in stored procedure. I hope you enjoy our work!